The Evanston Hockey travel program offers more ice time, professional coaching and a higher level of competition. Teams are offered from 8U (Mite) through 14U (Bantam) (Click here to confirm your child's level by birth year). Travel hockey practices are 2-4 hours per week in multiple sessions (typically weeknights) and have a weekly (off-ice) session at Precision Multisport. Travel hockey teams play 30-40 games, including one local and two out-of-town tournaments (typically within reasonable driving distance of Chicago and will spend the night at a hotel – 4-6 nights total for the season). Tournaments are a required part of travel hockey. All players are expected to attend tournaments with their teams. Conditioning for travel begins in August; tryouts begin in early September; the season ends in March and typically includes a two-week break during the winter holidays. There is also a spring season that lasts from March-May. Registration typically opens about 4-6 weeks before each season starts. If you would like to be added to our mailing list to find out when registration opens, please email . Evanston Hockey works hard to keep season fees steady. Travel hockey fees are announced in advance of conditioning and tryouts with discounts available for goalies and multiple siblings. Fees range from approximately $2,900-$4,600 depending on age level. Evanston Hockey covers the cost of tournament entry fees for one tournament. Additional expenses (e.g., hotel, meals, additional tournament fees) are paid for by the team, typically $200-$300 per player. Financial aid is available for those who demonstrate need. The dues adjustment form can be found on the website. It should be completed and forwarded to the Evanston Hockey treasurer ( ) in advance of registering for each season. The Evanston Hockey Finance Committee will consider all requests. Email questions to . The schedule for all travel teams can be found on evanstonhockey.com. You can view the master calendar to see the schedule by week or you can view individual team schedules on the team pages. To stay current, you can download the most up-to-date schedule, which would include any changes as they happen, to your mobile devices and online calendars by clicking on the "options" drop down menu on each team's page. If you have more than one player, you can access multiple schedules by clicking on one of the team's pages and then clicking on "multi-schedule" where you have the ability to select more than one team to view schedules simultaneously. Evanston Hockey makes every possible effort to ensure that our tryout process for travel hockey has integrity, inspires confidence from parents and players and builds competitive teams that challenge players. Travel hockey provides players with a more intense practice and playing schedule geared toward a higher level of competition. It involves more ice time, significant instruction by a professional coaching staff and games played against other teams generally of a similar skill and commitment level. Evanston Hockey travel tryouts are closed. This means that only skaters and coaches are allowed into the main ice area during tryouts. Our preference is to have the kids focus exclusively on the coaches’ directions, particularly since coachability is one of the primary criteria used to evaluate players. Skill: What is the player’s level of competence in core skills — including skating, passing, puck control, checking (14U (Bantam) level and above) and shooting? Attitude: What is the player’s attitude on the ice — toward the coaches, toward other players and toward himself/herself? Coachability: How receptive is the player to instruction from the coaches? How well does he/she apply that instruction? Hockey Sense: What is the player’s level of understanding of positional play and does he/she demonstrate an awareness of the game and positive decision-making abilities? Work Ethic: Does the player demonstrate the willingness to put in sustained effort necessary to improve his/her own skills as well as the team? Athleticism: What is the player’s individual athletic ability — including speed and strength? Positional Needs: What position will this player most likely play — and how does that factor in with team needs at that position? The hockey director and all coaches for each age level meet in person after tryouts are complete to review the number rankings and discuss each player. Input from previous coaches also may be considered. Teams are then finalized with input from all coaches who performed evaluations, as well as the hockey director. Rosters are usually posted within 72 hours of the final tryouts. Teams may be divided by skill level or by birth year at the discretion of the hockey director. Our coaches and hockey director work hard to get it right. We know that tryouts can be a stressful part of the season. We want every child who plays for Evanston Hockey to expand his or her skills and continue to love the game. Is it possible that we don’t get it right 100 percent of the time? Yes. We can assure you, though, that we care about our players and do everything we can to place each athlete at a level that will be challenging, advance hockey development and be fun. If you have questions about your child’s team placement, we are happy to address them. Please contact Del Morris at , and we will set up time to talk to you about your child’s strengths, development opportunities and how he or she can build skills in the year ahead. AHAI is the governing body of youth hockey in Illinois. AHAI has a two-choice rule for players where players are given the opportunity in Tier II programs (compete at "AA" and "A" levels) to change organizations once during their playing years from 8U (Mite) to 14U (Bantams). Click here for the AHAI two-choice rule. Travel teams compete in the Northern Illinois Hockey League, play games throughout the Chicago area against other travel programs and attend tournaments in nearby states. 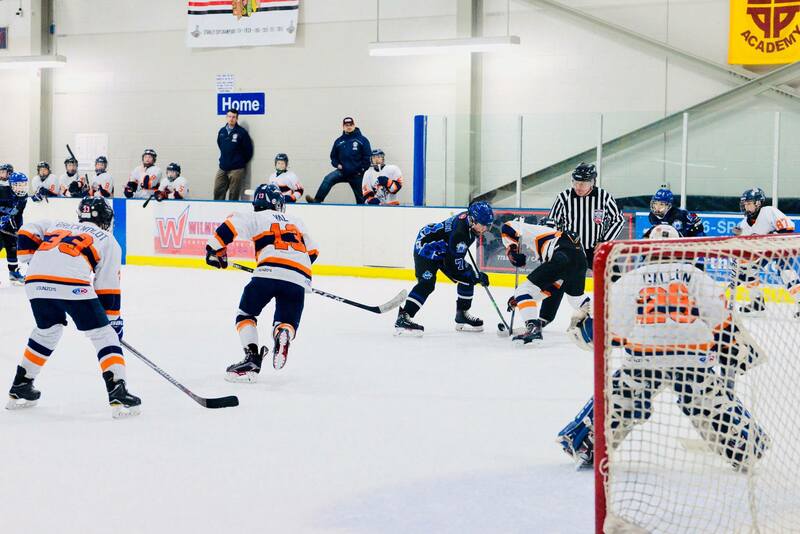 Evanston Hockey travel teams are among the finest in the Chicago area, routinely winning tournaments and placing among the top teams in their respective NIHL divisions. Note: Evanston Junior Wildkits Hockey offers 8U (Mites) the opportunity to play competitive, full-ice games against other programs from northern Illinois. Its teams compete in the Chicago United Hockey League that is affiliated with the Amateur Athletic Union. For more information on the Junior Wildkits go to JuniorWildkits.com. If you have any questions about the Evanston Hockey travel program, please .